During the cold months of the year which we often think have stopped with Christmas we often worry about our feline friends who enjoy exploring the outdoors. 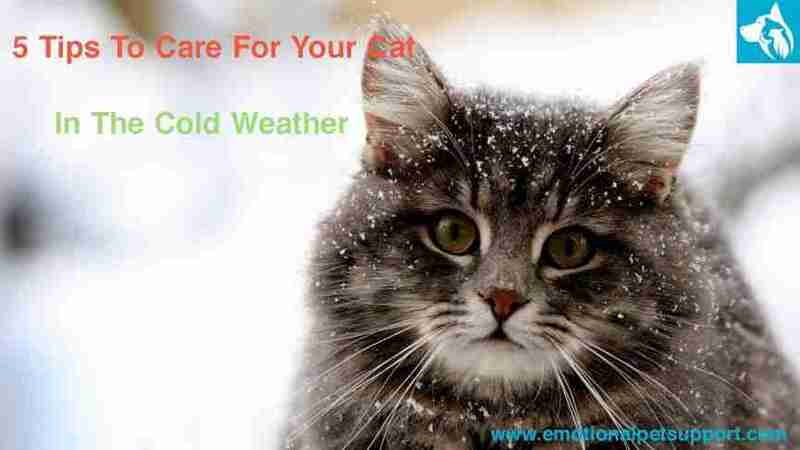 While cats are well adapted to the cold weather, they can still become unwell when exposed to extreme weather. If you plan on having an emotional support cat be with you during trying and difficult times, you may want to ensure that it is kept alive. Making sure they are looked after is important. When the temperature drops below 0⁰C, your cat may be at risk of frostbite and hypothermia if they spend prolonged periods outside. Unchecked, hypothermia can lead to serious consequences, so make sure they’re in good physical condition during winter. Illnesses from the cold can reduce the lifespan of your cat if left unchecked or untreated. While cats are not susceptible to the same cold virus as humans, they can get infected by a different virus that produces almost identical symptoms. Keeping your cat fit can help it fight the woes of the common cold. Symptoms of the cold include sneezing, nasal discharge, eye discharge, mild lethargy, mild fever, and loss of appetite. If your cat is coughing, this could suggest more than a cold and indicate the infection has spread to the lungs. If this happens, take your cat to the vet; some infections can lead to more serious conditions such as pneumonia. Frostbite, the damage to body tissue caused by exposure to extreme cold, is another condition that can harm our pets. Luckily, it’s a rare occurrence for most cats, but the ears, nose, tail, and toes (or any area where the hair is thin) can still be susceptible to frostbite. Areas that are affected will be a bluish white colour and will feel cold to touch. This is due to the lack of circulation in the area caused by the cold temperatures. This can sometimes be difficult to see if cats’ pads are a dark colour, so also look for limping or a reluctance to move. 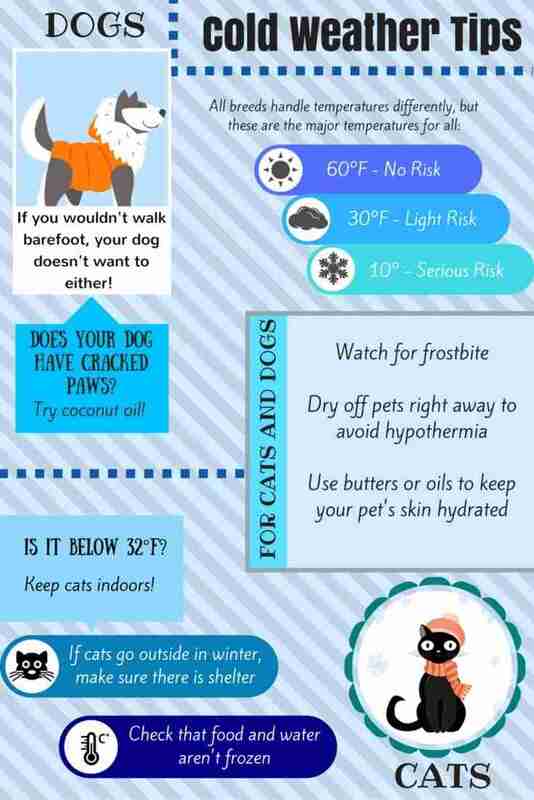 The best way to prevent your cat from suffering from frostbite is to make sure it’s never left outside in the cold for long periods of time. Thanks to their adventurous nature, cats can often get trapped in sheds or accidentally left outside during cold nights. If this happens, and your cat returns home showing signs of frostbite, the best thing to do is warm the skin with a moist towel to stimulate the circulation. Do not rub the area as this can cause more damage. The skin will redden as circulation returns, and it is then advised to apply aloe vera to the skin. If the affected area turns dark this can be a sign of severe tissue damage. You must take your cat to the vets immediately for further treatment. Cat Hypothermia, the condition of having an abnormally low body temperature, is a serious problem that cats may face during the winter months. 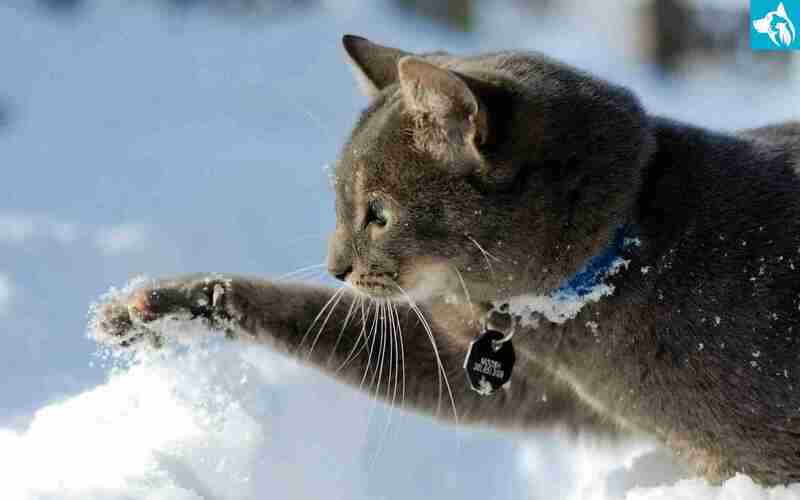 Cats can suffer from hypothermia if they are left in cold temperatures for too long. It also occurs when they’re exposed to the cold while already suffering from an illness or poor circulation. Pets suffering from the condition will shiver and show signs of tiredness. This is followed by their heart and breathing rates slowing down. The best way to prevent your cat from getting too cold is to make sure it has 24/7 access to a warm, sheltered place. If your pet shows signs of hypothermia it’s important to take it to the vet immediately. In the meantime try and raise their body temperature with warm blankets or a towel-wrapped hot water bottle. Cats tend to explore at night, but it is important that they have a shelter to keep warm in. Once their owner goes to bed, outdoor cats without a cat flap can’t get into their warm home until morning. Temperatures are at their lowest in the middle of the night so make sure there is a warm shelter available at all times. If your cat prefers the indoors, make sure they are home and safe before you go to bed. Furthermore, it’s a good idea to provide shelter for both strays and cats who are allowed outdoors so that they don’t end up shivering out in the cold for hours. Wedge doors of sheds and outbuildings slightly open (so cats who do manage to get inside don’t get locked in) or install a catflap, or create a mini snow shelter cats can take cover under. A sturdy cardboard box under plastic sheeting will do the trick. 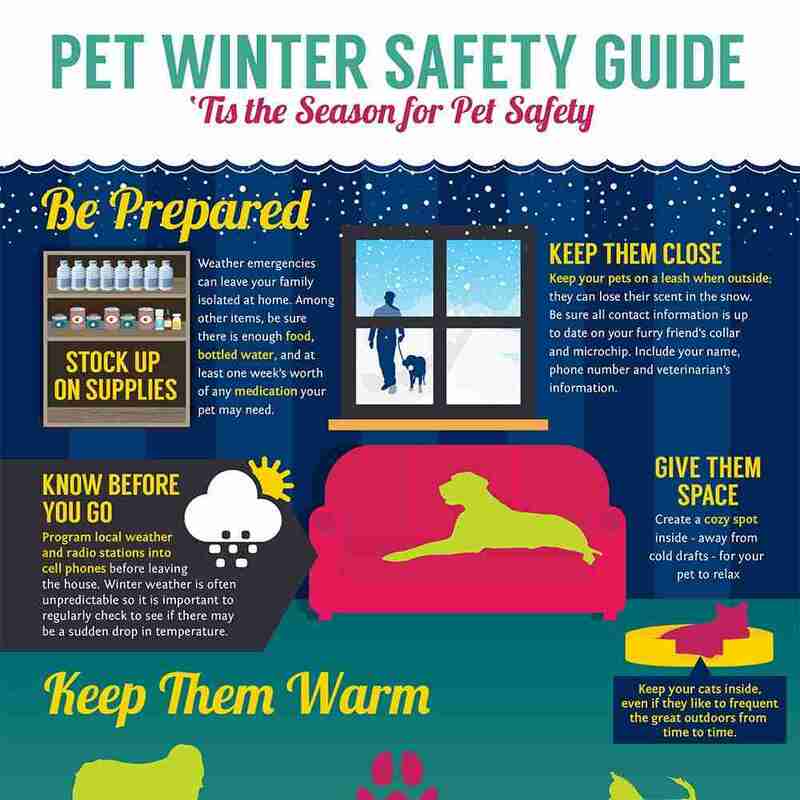 Regularly replace your pet’s water as it will freeze in cold weather. Without fresh water, cats will drink from gutters and puddles. These can contain toxic chemicals, especially during winter when antifreeze is regularly used. Water is essential for your cat’s health and wellbeing. Also, is your cat more keen on drinking from the toilet and taps rather than the pristine bowl of fresh water next to his food dish? If the answer is ‘yes’, then remember that fresh tap water is normally treated with chemicals and often chlorinated. The bowl itself may smell of the detergent with which it was cleaned – and therefore is an unnattractive prospect to a cat. As cats are many times more sensitive to detergent contamination than humans, much more rinsing than usual is required. You should also get into the habit of changing the water frequently to prevent bacterial build-up. Glass or ceramic bowls are preferable to plastic as they are non-porous and are easier to keep clean, they also keep the water cooler – on hot days it’s worth slipping an ice cube into your cat’s bowl. Genetically cats are programmed to seek out clean water as stale, stagnant water is more likely to harbour disease, so cats learnt to avoid such sources of hydration. It’s also a good thing to remember that cats do not like to bend their whiskers while eating or drinking, so ensure that your bowls are large enough. One simple answer to the problem of providing constantly flowing water is to buy a pet drinking fountain, which you can plug into the mains. The constant movement oxygenates the water for a fresher, cooler taste that cats will enjoy. Most fountains will have an adjustable water flow and a replacable charcoal filter, which will remove bad tastes and odour. It’s also worth checking how noisy your fountain is – especially loud ones can put off cats from approaching and drinking. If your pet displays the signs of poisoning, which include loss of balance, vomiting and lethargy, seek help from your vet immediately. If the cold makes your cat under the weather, make sure they are insured for a trip to the vet. In cold weather, cats will look for warm spots to sleep in. They tend to find warmth around car engines, so check under your car and around your cat for any unaware or napping cats. Animal rights begins at home because we have a moral duty to look after our pets. But do you go as far as traffic training them? Motorists kill many cats every day. Yet it is simple to teach your cat to be weary of motor traffic. A few short lessons will last a long time and increase the probability of your cat’s survival. This technique is most effective on kittens because they are more impressionable. You can traffic-train older cats. But some older cats may be unable to learn, so the technique may be somewhat less effective with them. However, you can make up for the older impenetrable cat by going about their training thoroughly. Encourage your cat to go to the road when there is little traffic, perhaps early morning or late evening. Leave the front door of the house open and go with him equipped with a large saucepan and big spoon. Wait for a vehicle to come along (a particularly noisy one is best) and get between it and your cat. When the vehicle is about to pass, repeatedly bang the spoon on the saucepan and yell to make a startling din next to your cat. Immediately rush with your cat to safety indoors. Ensure you drive him in front of you. You do not want him to seek refuge under a parked car or something else. Act as a model for him to emulate. Look and feel scared. You have both had a narrow escape, almost caught by a terribly dangerous predator, but now you are safe indoors and can begin to relax. Carry out this procedure once or twice a day for a few days. Before you start try a silent full dress rehearsal without your cat to make sure all will go smoothly. By pairing the approaching vehicle with a loud startling noise and by setting your cat an example to follow, he will perceive oncoming vehicles as objects to stay clear of. Cats keep an eye on others around them and act according to what others do. So always be a good role model – very important. Try to get the other members of your household to do the same – consistency is crucial. As time passes your cat will be less inclined to run. He will become more accustomed to vehicle noise and realise he can safely sit by the road. So from time to time show him for the rest of his life that the danger still exists. Should you be with him by the road when a vehicle comes along, get between him and the vehicle, shoo him homewards, clap your hands and yell. Never stand in the road and look relaxed or you will be undoing his training by showing him that motors are not so bad. When the weather turns really cold, it’s best to keep cats indoors where it’s nice and warm. However, cats being cats often want to go out in the evening and sometimes they don’t come back in for the whole night. It can be very worrying when your cat stays out all night when the temperatures are very cold and you may find that when they do reappear, they are very cold. If you suspect your cat has a touch of frostbite, you need to slowly warm them up using blankets and towels before getting them to the vet for a thorough check-up. Frostbite doesn’t show itself straight away but only really becomes noticeable around 48 hours later which is something you need to bear in mind when you take them to the vet. You can register your emotional support cat with us by taking our 10-minute exam.